This isn’t looking very good for the Bulls, who fell Tuesday to 8-8 after an 80-76 loss to the Indiana Pacers that, nevertheless, left them in a three-way tie for the Central Division lead. That would be somewhat the equivalent of being the star of The Flintstones in Viva Rock Vegas movie. Nice to get top billing, though no one wants to see you. It was that sort of looking away as well Tuesday as the Bulls shot better, if you can call it that, 38.4 percent and lost. The game ended badly — if the Bulls also felt somewhat unfairly — with Luol Deng failing to draw a foul call while driving to the basket after colliding with Pacers’ center Roy Hibbert with 5.9 seconds remaining and the Bulls trailing by two. The Bulls then fouled and the Pacers made both for the final margin, though it was Paul George in a heck of a LeBron James impersonation with 34 points, nine rebounds, three steals, two blocks and virtually unguardable even to the Bulls best defender, Deng. This was a fairly unusual post game reaction from Thibodeau as he generally gives the officials the benefit in close situations. The NBA rule is if a defender goes straight up, even with contact, it is not a foul. Pacers coach Chip Vogel (It’s actually Frank, but he looks like a Chip) said Hibbert went straight up. I thought it was a foul as that sort of body contact generally draws a foul. But it became one of those game ending situations in which officials sometimes let contact go to in theory to let the players decide it. And Deng would have had to make both free throws for the tie and then a last shot for the Pacers. “We shot ourselves in the foot,” Thibodeau said. Which was one of the few things Bulls players hit in a mostly loathsome effort only matched by the Pacers’, who shot 36.3 percent overall, 31.6 percent in the first half, and two of 10 on threes. George was pretty remarkable with numerous off balance, well defended shots and 11 fourth quarter points. This from a talented player, but one who came into the game scoreless in his last game in 29 minutes, two of 18 shooting in his last two and seven of 31 on the Pacers’ recent three game Western trip. Both teams defend and rebound well, and the exception was someone, this time George, making shots. Only George and Carlos Boozer with 14 points and 10 rebounds, shot better than 50 percent while Nate Robinson off the bench led the Bulls with 19 points, 11 in the fourth when he both saved the Bulls and then threw them overboard again. But tied for the Central lead also means the Bulls are a half game out of ninth place in the Eastern Conference. And the scary part is they are just about at the end of concluding the easiest part of their schedule. They’re tied for the fewest road games played in the league and have played half as many as the Pacers. In the Bulls 16 games, 10 have been against teams with .500 or below records, and the Bulls have played just two of the eight so called elite teams in the league, meaning teams at least four games over .500. They lost both. After playing in Cleveland and Detroit this week, the schedule turns for the Bulls with nine consecutive games against teams with winning records until playing the Pacers in Indianapolis the day after Christmas. It’s possible Richard Hamilton, with a torn plantar fascia in his left foot, will not return before then, leaving the Bulls even more offensively challenged and in danger of falling toward the bottom of the East standings. But it seems unclear where that comes from as Thibodeau has experimented with lineups and rotations throughout the season. And Deng and Joakim Noah — the latter with nine points, seven rebounds and another technical foul, his fourth of the season which puts him just one behind the league leaders, Carmelo Anthony and DeMarcus Cousins — again combined for about 80 minutes playing in giving the team just about all they can. Deng finished with 17 points and seven rebounds. Belinelli had six points, but attempted just five shots in 24 minutes. He isn’t nearly as slick as Hamilton in finding space for shots, a relatively unappreciated talent all the great shooters have. But the Bulls need to find Belinelli more. With Deng struggling at five of 15 and Taj Gibson scoreless in 21 minutes, though he was active on the boards, Thibodeau finally had to go to Robinson for offense. You don’t have to tell Robinson to shoot or question whether he can find a shot. He’ll do that, and he brought the Bulls back from the edge of defeat in the fourth quarter with a three pointer at the 24-secoond buzzer, a long rebound he took and went all the way for a layup and high arcing scoop drive that got the mostly somnambulant home crowd to stop checking their smart phones for early updates on the Hong Kong markets. With the Bulls mostly anemic offense, Robinson is one of the few players who can get on a run like that. His drive for a pair of free throws gave the Bulls a 72-68 lead with 5:10 left. But this is the issue with Robinson no coach ever has figured out: How long to let him go. Though Thibodeau prefers to finish games with defenders, the way George was going it was clear he needed some offense. So while going back to Gibson and Jimmy Butler with Deng and Noah, Thibodeau elected to stick with Robinson. Robinson came out of the timeout firing a one-one-one runner that missed almost off the top of the backboard. The Bulls defense was good trying to help on George, though Thibodeau didn’t always see it that way. George missed. But Robinson then turned the ball over after dribbling himself into the corner, now going two straight possessions and maybe 35 seconds of play clock time without passing to anyone. George began to get to the rim and was fouled, making three of four and David West and Deng matched scores as the teams went into a timeout with 2:36 remaining tied at 74. This was where Thibodeau was the gambler staying too long at the table. He got a great run from Robinson, but he also wasn’t getting much offensively from Belinelli, Butler or Kirk Hinrich. So he stayed with Robinson. Robinson missed a three early in the clock. George then took a handoff from West and made a 20 footer with Deng all over him for a 76-74 Pacers lead with 2:06 left. Deng airballed a three. The Bulls defense remained strong as Noah blocked Hill driving and then forced George into a miss. But the Bulls couldn’t do much. They tend not to push the ball much anymore, mostly settling into half court sets. But Robinson pushed it out of the backcourt and threw a lob to a running Noah that sailed over Noah’s head and out of bounds. Perhaps that’s why they walk the ball up more. With 57.2 seconds left and timeout, Thibodeau went back to Hinrich for Robinson. But the Pacers then made the first late big play. 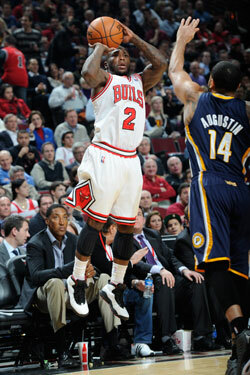 With Butler looking to help in the middle, Lance Stephenson got behind him along the baseline. West darted a pass that Stephenson converted for a layup and foul. He would miss the three-point play chance, but the Pacers led 78-74 with 45.5 seconds left. Thibodeau had some nice plays out of timeouts, at least when Robinson wasn’t shooting threes, and Noah and Boozer combined for a slick two man — which the Bulls need to do more of — with Noah finding a cutting Boozer for a strong layup in traffic to bring the Bulls within 78-76 with 39.2 seconds left. 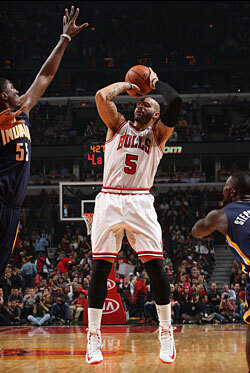 But Boozer missed a big free throw. Noah on that play had made a terrific interior pass after faking a handoff to the inbounder. But Noah also has had a tendency to try too many of those “thread the needle” passes, as Thibodeau likes to call them, and had five turnovers. Deng and Robinson had four each. The Pacers then held the ball until about seven seconds on the shot clock. George Hill handed off to West for a jump shot that missed badly and Gibson rebounded. The Pacers run some of the most unimaginative offenses, plenty of simple high screen roll with little action off the ball or on the weak side. But their defense and rebounding is strong, they are No. 1 in opponent field goal percentage and they and the Bulls could play 100 games and no one would likely score 100 points, though Danny Granger remains out for them. So the Bulls got the ball back with 14.1 seconds remaining and trailing 78-76. It would not quite be a Hue Hollins moment for Bulls fans from 1994. Deng was the inbounder and Robinson was back in along with Hinrich in a pairing we haven’t seen much of. Deng passed to Noah, who does as much playmaking as any of the guards, especially on the interior, and may be the team’s best passer from there. Deng cut from out of bounds toward the rim. George was defending and anticipating the pass. So Deng faked a cut back to the sideline, and when George bit, Noah threw a backdoor pass that Deng caught just off the low block on the right side. George was beaten, but Hibbert, who had 10 points and 11 rebounds, came across. He was running toward Deng, so usually it would be hard from that position to stop and then go “vertical,” which the NBA rule requires for a defensive play. Hibbert came to a something of a stop and went up, so he was hardly set as most of his body parts rarely make coordinated movements. Deng and Hibbert made powerful body contact, but referee Tony Brown with the baseline call was quiet. Deng dropped the ball, which was collected by the Pacers. Noah spread his arms in disbelief. Thibodeau stalked the sidelines stunned and blue, both in his language and feelings. The crowd erupted in angered disbelief. It didn’t seem to me Hibbert jumped straight up at all. He was moving and barely had time to stop. But it’s also a conundrum for officials as they don’t like to be blamed for a game being decided by free throws. Yes, a foul is a foul anytime. Or should be. But basketball also is a game of feel sometimes, and sometimes they let things go. If Deng had followed through with the shot he likely would have gotten the call. But at the same time, he had to be hit awfully hard to lose the ball as he did. It’s fine of Deng to take blame, which he doesn’t deserve or get. I prefer to accept the officials’ judgments even when I don’t agree as it is so difficult to judge an NBA game in quick bursts with so much contact. Others will say LeBron or Wade or Kobe would have gotten that call. Maybe. The NBA is trying to enforce more so called verticality no calls, which I call the Omer Rule as he always went straight up and always was called for a foul. In any case, that pretty much ended it. West, in a poor effort mostly, made his two free throws and the Bulls got one last drive at the rim that missed. Though the Bulls play hard, they do play soft at times, tipping misses rather than grabbing them and going back up hard for scores or fouls. The Pacers had 27 free throws to 20 for the Bulls. It had been a brutal start for both teams, West and George Hill a combined one of 10 for the Pacers in the first quarter, though Indiana led 20-18. Robinson gave the Bulls a little scoring boost in the second quarter and Boozer and Noah again teamed for a pair of nice plays late to give the Bulls a 37-35 halftime lead. In the third, Hibbert got a couple of scores getting Noah out of defensive position and the Bulls fell behind 60-55 heading into the fourth before Butler had a nice steal and runout score and then Robinson gave some and took back. You want to get some of those before a season starts slipping away.